Notes: Based on a manga by Okamoto Hotaru and Tone Yuuko. The original version of this review mistakenly referenced Miyazaki Hayao as the director of this film, but the actual director and screenwriter for this work is Takahata Isao (Grave of the Fireflies). Although Disney has the rights to this film, as they do to most Ghibli movies, they have yet to release it on DVD in North America, and it is currently not legally available in the United States in any form. Okajima Taeko, a 27-year-old career woman, has never really felt that she fit in with everyone else. All her life, she's felt that something was missing, although she could never really figure out just what it was. Tired and bored with her current lifestyle, Taeko decides to take a ten-day vacation to her sister's husband's relatives' farm to help out with the safflower harvest. Recollections of events during her 5th grade year begin to resurface in Taeko's memory as she makes her trip and also while she helps with the harvest. As she remembers more and more, Taeko begins to come to a realization of what she has become as a result of some philosophies she first adopted in fifth grade -- and eventually is faced with an important decision concerning what she can do to change. You know, it's really nice to finally be able to review something good. 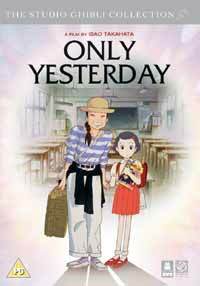 Anyway, Only Yesterday is another great movie from the venerable Studio Ghibli, but then, what movie of theirs isn't great? But I digress. Only Yesterday isn't anything you can pin down to a category, it's something of a cross between a journey of self-realization and re-evaluation of life on the part of our main character Okajima Taeko. The artwork and animation were of typical Ghibli quality, excellent of course. The backgrounds in this film were absoulutey amazing; shoot I wish I could take photos half as good as these things. The depth and attention to detail are unparalleled by anything except other Ghibli films. Let's not forget about the animation; during parts of Only Yesterday, I could have sworn that they had used live action clips in place of animation. In short, nothing I have seen so far rivals Only Yesterday in terms of technical excellence. The plot wasn't really anything to get excited about, but that doesn't matter. I found myself getting more involved in the character development of Taeko than really following anything in the storyline. The way that the movie went from adult Taeko to fifth grade Taeko and back was kind of confusing at first, but as soon as I understood what was going on, it seemed to work quite well. I found myself really caring about what happened to the characters, and that rarely happens when I watch anime: from our heroine Taeko to her idiot friend Toshio. They just drew me into their little world. There wasn't much that I didn't like about this film; about the only thing that I really had a problem with was the quality of tape that I saw, but that didn't detract from the excellence of this title. I really hope that Disney releases this sometime soon, as it will be a title that I would like to add to my collection. To sum it all up, if you like Ghibli, Only Yesterday is another great movie to watch, and if you've never heard of them...shame on you. Recommended Audience: There is some discussion of puberty and menstruation during the segments with ten-year-old Taeko, which really shouldn't upset anyone but probably will anyway. Otherwise, nothing here a little kid couldn't see, although I think most kids (and folks disinterested in the material) might find this kind of boring.